BEAUTIFUL YELLOW FLORAL PATTERNED FITTED DRESS FROM OASIS. UK SIZE 12. Stylish Oasis Fit & Flare Dress. Ideal for wedding or special occasion & looks great with a jacket. Worn Once. 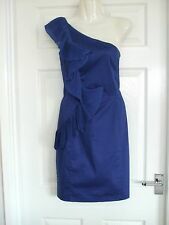 LADIES STUNNING SPECIAL OCCASION SUMMER DRESS BY OASIS SZ 12 . Condition is New with tags. Dispatched with Royal Mail 2nd Class. Zip at the side of the dress. Dress is lined. Material: Dress: 96% Cotton, 4% Elastane. Lining: 100% Polyester. A beautiful elegantly cut dress.The dress has long wavy borders on the sides of the front panel. The material is lightweight and lined. Our policy is to standardise as much as possible. All faults are clearly described. Oasis Size 8 EU34 Cotton High Waisted Floral Print Pencil Dress Summer wedding. Condition is Used. Dispatched with Royal Mail 1st Class. Oasis Size 8 EU34 Cotton High Waisted Floral Print Dress Summer wedding. Condition is Used. Dispatched with Royal Mail 1st Class.